This all became clear in the first months of 2011 when our attendance crashed. At the same time, we lost about half of the members of our leadership team - folks who were committed to overseeing the CHF church plant. Within just a few months, we went from being a group with apparently rocketing growth and vitality to being back almost at square one. This was a really dark time for me, personally. It felt like everything we had done thus far had been a waste. We had a lot of really great people come and worship with us at our Wednesday night gatherings, and Christ was present in our midst. However, following the winter holidays, very few of those folks were coming anymore. 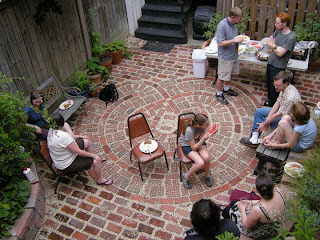 For whatever reason, Capitol Hill Friends had ceased to be a hot event for area Quakers. It was at this point that we - the remnant of the leadership team - decided to move our meetings to Sunday nights. We would meet more regularly, and on the day that most people associate with gathering as a church. I give thanks to God for the way that the Holy Spirit has guided us. We are still in the earliest stages of this new life that is being revealed to us as a church. Because so much of our growth is happening under the surface, it is impossible to understand yet what is really happening. Yet we do witness positive change in our life as a community. We are growing in our walk with Christ; in our relationships to one another in him; and in our understanding of what God's call is for us as a community. As I sat in front of the Post this morning, I became fully conscious of my anger and bitterness towards members of Congress who are placing my country - and, indeed, the world - in jeopardy for the sake of political grand-standing. I was so angry, I prayed that God would punish those in the government that are willing to sacrifice the livelihoods of the poor and middle classes to uphold the privilege of the super-rich. I did this in the tradition of the Psalms, which feature many prayers for God to punish wickedness. A good friend of mine calls these the "Get 'Em, God!" prayers. This morning, I could really relate to the angry psalms. Yet, as I prayed for vengeance, the Lord called to my attention the words of Deuteronomy, which Paul cites in his letter to the Romans: "It is mine to avenge; I will repay" (1). I sensed these words as a response from God. With them, the Lord asked me: "Have you forgotten your calling and my promise?" I, on the other hand, am a lot like James and John, who did not yet understand that following Jesus was about receiving cruelty rather than inflicting it. Luke describes how, after being treated rudely by the people in a Samaritan village, the disciples asked Jesus, "'do you want us to call down fire from heaven to destroy them?' But Jesus turned and rebuked them. "(3) Jesus did not come to condemn. I ask for God's forgiveness for my failure to love my enemies and bless those who curse. I ask for a heart remade in the image of God and indwelled by Jesus himself. Let me love, Lord, as you love. Let me be a blessing to all, even those who are indifferent to the consequences of their abuse of power. Give me faith to lay aside my desire for vengeance and to give over all power, glory and dominion to you, Lord God Almighty. 5. I am aware that this is a complicated issue, and that Scripture does say that, "the Lord's people will judge the world" (1 Corinthians 6:2). Nevertheless, while the Church may have some role in the final judgment, I believe that we as individual Christians in this present age are not entitled to participate in God's judgment. I would like to emulate Mary Teresa's witness. Though I must admit that I have no desire to bear the inward cross of spiritual desolation that she did, I see that this intense darkness (and her continued faithfulness in it) was the highest mark of sanctification and union with God. She truly got a taste of Christ's spiritual desolation as he suffered and died on the cross! It was not that God was not present with her. Rather, God was powerfully present in her life, but she could not feel God's love and peace in her soul. She was left desolate, even while living a life of saintliness and union with God. How amazing. How true to the experience of Jesus! I see that this is what I fear and flee: the dreadful reality of death on the cross. It brings about the resurrection, laying the groundwork for rebirth in Christ. The suffering of the cross is central to God's plan of cosmic redemption. Yet, it is so dreadful to my soul. Terrifying! It represents the death of the willful self, the "old man." But I can see the blessedness of this self-dying in the witness of Mary Teresa. While I cannot bring myself to long for the agony of the cross, I do pray to die to self so that I can live fully in Christ - so that Jesus can come to live fully in me, just as he seems to have done in Mary Teresa. This is radical stuff. I was raised to focus on my own personal fulfillment and advancement. Individual happiness was always the name of the game. But what if happiness is not the point at all? What if suffering is not, in fact, tragic? What if suffering is actually an integral part of the divine plan? This impacts the question of theodicy. Because, of course, while theodicy technically means "why evil?" in practice it tends to mean, "why suffering?" While it is certainly right to say that evil results in suffering, it does not necessarily follow that suffering is evil. What if suffering is like an antibody that God has created to combat evil? What if suffering is a God-given part of the cosmic "immune system"? What if suffering is the only path to healing? What would the implications be for those of us (the vast majority, I imagine) who avoid suffering whenever possible? I am so glad that I yielded to the Lord's guidance in this matter. My time among Friends in North Carolina was blessed with a deep sense of Christ's presence in our midst. Jesus was present, teaching his people, and I was blessed to take part in the labor. In many ways, the living connections between our Yearly Meetings are in danger of being lost. Ever since the emergence of the Conservative Friends tradition, the primary way that we have recognized one another is through the formal exchange of epistles. In continuance of this tradition, the Yearly Meetings in Iowa, North Carolina and Ohio all exchange personalized epistles with one another. Yet, the organic and relational connections between our bodies have become so tenuous that it is no longer clear to many Friends why these epistles are exchanged. One well-meaning Friend in North Carolina last week posed the question of whether NCYMc should adopt the practice of composing only one epistle - "to all Friends everywhere." This trip convinced me that, if we continue down the course we are on as Conservative Friends, our exchange of epistles will soon be a formality - a fiction that masks a lack of real community. I do not believe it is too late to revitalize these relationships, but it will not happen without care and effort on the part of concerned Friends. This was made clear during the business sessions this morning, when Friends here in North Carolina considered the question of their Yearly Meeting's presence on Facebook. It turned out that an individual, years ago, had created a Facebook group for NCYMc, which most members of the Yearly Meeting had never heard about. This revelation presented an opportunity for Friends to consider how they as a Yearly Meeting might relate to this new form of communications technology. There were also questions about the open commenting feature on the group. How would these comments reflect on the Yearly Meeting? While many Friends felt that it was not in right order to restrict public statements by individual Friends, they wondered how care and oversight might be extended to the Facebook group. In the future, might the elders of the Yearly Meeting be charged with administering the body's Facebook presence? I am heartened to see that Conservative Friends in Ohio and North Carolina(1) Yearly Meetings share the conviction that our Christian faith as Friends is not merely a matter of personal experience and expression. As Friends in North Carolina minuted today, "ours is an experience of a faith community, not an individual." This is a belief and a way of life that I believe Conservative Friends hold in common. Customs and technology change, but Friends here in North Carolina seem convinced that discernment and action based in community are worth conserving, despite the pressures of Western individualism. The new power that the internet grants for individuals to express themselves does not mean that we as Friends should abandon our tradition of waiting together as a community to find and act on the will of God. Conservative Friends are embracing new opportunities, but with a cautious eye towards preserving the unity and integrity of Christ's body. I give thanks to God for this witness. Something I like about International House of Prayer is its outward focus. IHOP is not primarily a contemplative community, but is oriented toward mission to the wider world. Even if I am uncomfortable with some of the directions that this mission takes, I do appreciate that it sees the fruit of prayer as being a sent into the world. IHOP embraces a view of prayer and holiness that changes both the individual and the Church, equipping women and men for ministry. IHOP does not see prayer as primarily a private practice. Instead, prayer is seen as a springboard into Spirit-led action for Christ's Kingdom in the world. I will confess that I am very skeptical of the ideological basis of IHOP. At the core of the movement lies a fundamentalist, even "dominionist"(1) worldview, with an intense focus on the "end-times." The major reason given for this movement of prayer and worship is to "hasten" the Lord's coming, to usher in the visible return of Jesus Christ to the earth and to establish a visible Kingdom of God. I myself do long for a final consummation of history and the final victory of the Lamb over the powers of sin and death. I do believe that God is raising Jesus up so that, "every knee should bend, in heaven and on earth and under the earth, and every tongue should confess that Jesus Christ is Lord, to the glory of God the Father. "(2) However, I tend to view this process as inward and spiritual. Rather than primarily awaiting the visible return of the Lord, my hope and experience is mainly of Christ's inward revelation and presence, here and now. The presence of God humbles the proud and gives comfort to the oppressed. The movement of the Holy Spirit inspires humble courage, not bravado. As Christ's presence purifies us and draws us deeper into the Kingdom life, we find ourselves not rising higher on the wings of emotion, but instead plunging deeper into the tender, unselfconscious love of our Risen Lord. Recently, I have been reading "Come Be My Light," a spiritual biography of Mary Teresa of Calcutta, including many personal letters between her and her confessor. The depth and humility of Teresa's prayer life has challenged me to re-evaluate my own minor efforts at maintaining a connection and conversation with the Lord. Teresa's life was bathed in prayer, and it is clear that this prayer was the foundation of her life and ministry. I am particularly impressed at the way that Teresa's deep devotional life led her neither to set herself above others, nor to cut herself off from the suffering of the world. Instead, she was led to such a deep engagement with suffering that she seems to have shared in Jesus' thirst(3), and his sense of abandonment by God on the cross(4). For Teresa, rather than serving as a form of escape or emotional catharsis, prayer allowed her to venture more deeply into the suffering of her crucified savior. From this profound, first-hand knowledge of Christ's suffering, Teresa could embrace the poor, sick and dying on the streets of Calcutta. Intimacy with the Tortured Savior gave her intimacy with the tortured lives of the poor and oppressed. True prayer is done in the power and humility of Jesus' cross. The purpose of prayer is not to exalt us, but to humble, purify and prepare us for lives of servanthood and friendship with those who are poor - either spiritually or materially. As disciples of the Crucified Messiah, prayer empowers us to embrace the suffering of Christ's body. 1. For IHOP's explanation of their "Dominion Theology," among other things, click here and scroll down. I will be honest in saying that the prayer did not always feel alive to me. Sometimes, it felt as though Friends were just saying words. At worst, there were times when so-called "prayers" turned into short sermons on one subject or another. There was a lot of preaching and praising. I confess that at times I longed for the silent, receptive prayer that allows for God's Spirit to come and fill us, providing the words for vocal prayer. This level of explicit acknowledgement of God's role in our life together stood in stark contrast to the way that I have experienced most of my communities in the United States. While perhaps some East African Friends are a bit too eager to fill the silence with words, my experience is that the temptation for many Friends in the United States is to neglect acknowledging God's presence altogether. Yet, while I often experience prayers based in silence to be deep and Spirit-led, there are drawbacks to this form of prayer. One disadvantage is that it can be compartmentalized. Because there is not always vocal prayer offered - perhaps not even a majority of the time - it is easy for silent prayer to become individualized prayer. Clearly, this is better than no prayer at all, but the corporate aspect is lost. In extreme cases, silent prayer can degenerate into "moments of silence." Rather than being an opportunity for expressing thanksgiving to our Creator, the silence becomes merely a time of meditation, reflection, or "centering down." Vocal prayer would seem inappropriate, emerging from such a moment of silence. We often perceive prayer as being personal, and potentially offensive. Many of us - regardless of our theological orientation - have bought into the idea that religion is a private matter. While silent prayer - especially in its individualized varieties - does not step on the religious toes of others, vocal prayer presents a greater challenge. When we offer vocal prayer, we may say words that do not fit with the beliefs of every individual present. Someone might get upset. How can we as Christian communities - and as Christians living in a non-Christian society - open a space for genuine, corporate vocal prayer? We fear looking foolish. Let's face it: Prayer can be pretty silly. The prayers that we offer to God are essentially love-talk, the simple words of children to our Heavenly Father. We do not like feeling like children - especially not in the presence of other adults! How can we become humble enough, as individuals and as a community, to be little children in the presence of God and of one another? As I sit down to write this letter, I am still loopy from jetlag. I am also feeling rather intimidated at the prospect of encapsulating this month's experiences into a brief missive. So much has happened in the last three weeks. I hope you will forgive me for being a little longer than usual. The next day, I took the train up to Derbyshire (the English pronounce it "darby-sheer") and visited Friends connected with the Ripley Quaker Meeting, which meets weekly at a local community center. It was a blessing to be with these faithful Friends. I had connected with many of them already through Facebook and Skype, but it was a real gift to spend time in the home of the Lomax family, and to see them face-to-face for the first time. On Sunday morning, we had a favored meeting for worship, with the power of the Lord Jesus being felt clearly in our midst. While in England, I was able to link up with the two British leaders from last Year's Quaker Youth Pilgrimage, as well as several of the pilgrims who live in the London area. It was great to catch up with these Friends and see them in their "natural habitat." I was also able to visit Ben Gosling - another affiliate of Rockingham Meeting - and his wife Libertad at their home in Lavenham (in Suffolk). It was lovely to spend time with these Friends, and to get a tour of the historic village they live in, which preserves many buildings from the medieval period. As fun as all this was, my own personal priority was to connect with the people of East Africa - especially Quakers. I was elated when we flew out to Kisumu (Western Kenya) and began to visit Friends there. They were not hard to find. In Western Kenya, Quakers are the largest single denomination and have a larger membership than all the Yearly Meetings in North America put together. It was quite an experience to be in a place where the Quaker Church is normative. When we had completed our visits in Western Kenya, we flew to Kigali, Rwanda. Rwanda surprised me with how different it felt from Kenya. In Kenya, there were unavoidable signs of intense poverty everywhere; in Rwanda, however, it was a little bit less obvious. The city of Kigali, in particular, felt very developed. Clean, orderly, and apparently relatively prosperous, Rwanda's capital felt similar in many ways to what I had experienced in the urban areas of Mexico (which is quite a developed country by world standards). During the week we spent in Rwanda, however, I began to learn about the dark side of Rwanda's apparent prosperity. When I started asking prying questions about the government, I learned that all is not as idyllic as is immediately apparent. One citizen informed me that she felt afraid to make any statement about the government that might be considered negative. However, because we were not in the company of other Rwandans, she helped explain why things look so nice in the cities and along the major roads in the countryside. Apparently, the Rwandan government requires that buildings be made in a certain style using certain materials. Tile roofs, brick and cement walls - solid, high-quality construction. Expensive construction. I learned that apparently the government not only requires this for new construction, but also has an active program that requires homeowners to upgrade their houses to the new code, especially if their homes are along major thoroughfares that might be seen by tourists. I was told that those who are unable to upgrade their houses to meet government criteria are evicted and have their land confiscated (frequently without any compensation). The properties are re-sold to those who can afford to improve the land. Our time with the brothers and sisters in Rwanda Yearly Meeting was lovely. They are an amazing group of Friends, who in only a couple of decades have developed a network of sixty churches across Rwanda, as well as an impressive system of schools and programs to give relief to widows and orphans. We were blessed and humbled by Friends' warm hospitality to us. Despite Rwanda's apparent national wealth in comparison to Kenya, it is clear that the common people of Rwanda still live in extreme poverty by most standards. In spite of this, we were welcomed with open arms and treated to lavish hospitality. It was a humbling experience to see Friends in Rwanda minister to us out of their material poverty. Guilty as charged. I pray for God's mercy, knowing that I have lived so long in material comfort and luxury that I have become blinded to the needs of the poor, marginalized and oppressed. Living in urban North America, it is hard to conceive of what material wealth truly is. Material wealth is having running water and electricity. It is having an educational system that is available to all. It is eating protein every day and having access to a variety of foods. Being rich is owning a cookbook and being able to purchase the ingredients for any recipe. I have often failed to realize what amazing blessings these truly are. These are things that should not be taken for granted. I have also seen more clearly what spiritual wealth is. Spiritual wealth is cooking up the best food that you have - even if it is just feed corn, casava bread, rice and beans - and serving it to guests who have traveled from far away to see you. It is only the spiritually wealthy who can show true love by giving generously, wrecklessly - not out of their own abundance, but out of poverty. True, spiritual wealth is welcoming guests, caring for orphans and widows, and seeing that the next generation gets a decent education. I have seen so much in the past weeks that has convicted me of my own spiritual shallowness and of the failure of the North American Church to take seriously Christ's call to take up the cross. I am still processing these experiences. I am unsure of where this all leads. One thing is for certain: I am a lot less far along in my walk with the Lord than I would prefer to imagine. Yet, I also feel a great sense of hope. Among Friends in East Africa, I have seen that the yoke of our Lord Jesus is truly easy, his burden light. If only we here in the North American Church would surrender our own privilege and sense of control, we could share in the easy burden of Jesus. I see more clearly now that I must lay down the burden of control, of self-protection, and of "having enough." I want to follow Jesus, and now more than ever I see that I cannot serve two masters. Clearly, though this letter has been much longer than usual, there is a lot left to process. I do suspect that I will do a lot of this processing in the coming weeks on my blog, The Lamb's War. I encourage you to subscribe to my blog if you have not already, or just check in from time to time. These experiences will definitely take some time to sort through, and I would welcome your accompaniment on this journey.